On February 6th, the Shenzhen Spring Festival Gala finally unveiled its mask and was broadcast to the global audience. As the frontier of reform and opening up, Shenzhen is not only the representative of “the Young and Fashionable City of Technology and Future”, but also the pioneer and model of building the future city. "Young, Fashionable, High-tech and Futuristic", the open-air show took advantage of the buildings and the landscape of the city, projecting different colored lights into 43 buildings. The 5885-square screen audio-visual feast and multimedia interactive stage together made a wonderful party. With neon lights shining, the robots were dancing to the rhythm, bringing about a sense of future and technology. 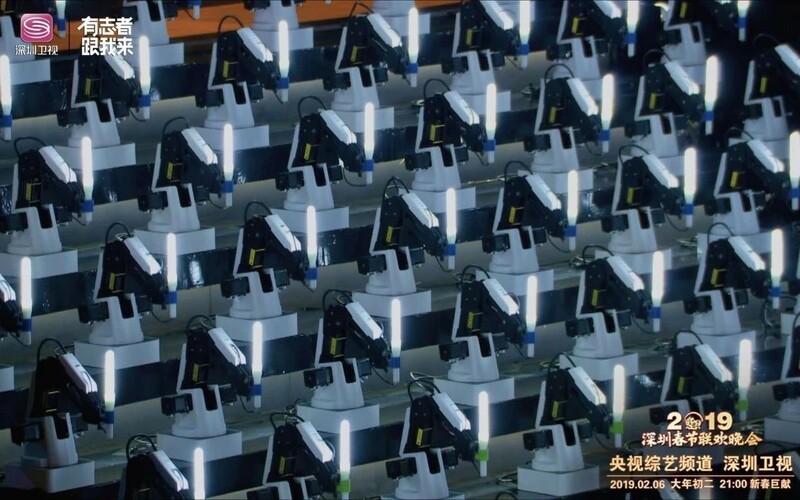 The lightweight robotic arm DOBOT Magician waved the glow sticks to the melody in a show named "On This Moment", sending a blessing to the national audience. This is the third time that DOBOT has been invited to participate in a grand performance like this, after being invited to the online CCTV Spring Festival Gala twice in 2017 and 2018. 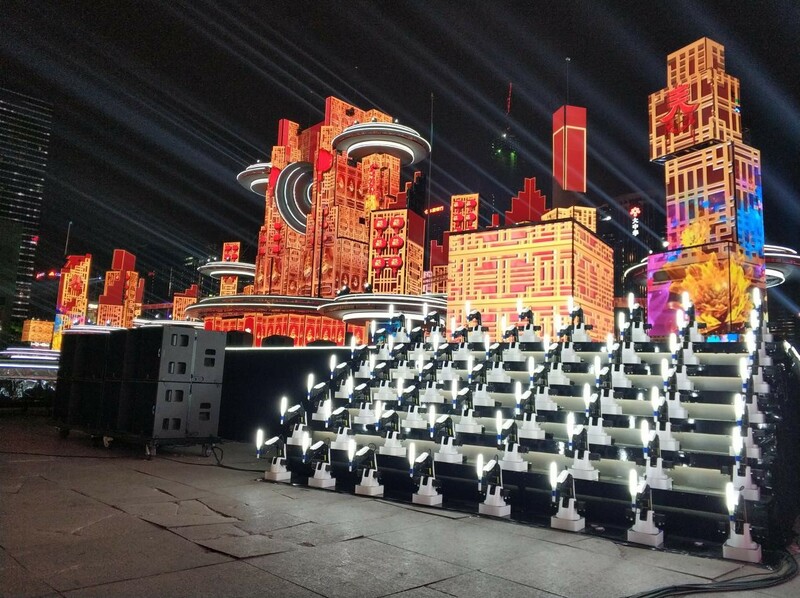 DOBOT robots' performance on Shenzhen Spring Festival Gala is full of creativity. DOBOT Magician is a multi-functional high-precision lightweight robot arm independently developed by DOBOT. It features a rich extendable interface, integrated graphical programming environment, handy secondary development and abundant extendable features. The robot's motion trajectory is programmed to match the melody and can operate in offline mode. 56 robots can be controlled together via external I/O interfaces. Once the instructions were delivered, the robots would uniformly swing their arms at the same time, highlighting the whole gala. The wonderful show relied on hard work. “The glow stick is fixed on the robot arm through a specific fixture. We designed a set of programming in advance to match the rhythm of the song.” According to the person in charge of the technology from DOBOT, “robots are harder to train compared to human dancers. Different actions require rearrangement of the programming logic and increase the difficulty level of ensuring the uniformity of these robots. The time was really tight to finish such a difficult task. All robots were finalized in half a month ahead of the performance, and were manufactured within one week after that." Besides being able to dance to music, DOBOT robots can listen, see, feel, and even demonstrate abilities in infrared, ultrasonic, radar, GPS, etc. when equipped with different sensors. Sensory intelligence is incorporated into robots to enhance their adaptability in various environments. Complex and diverse software unlocks the robots’ limits to create, including unlimited expressions and a variety of interactive activities with the audience. Jerry Liu, CEO of DOBOT, said in an interview that the robot arm is mainly used in industrial and service scenes, and DOBOT robotic arm exhibits precise motion control and first-class stability in the artistic scene. The unique openness of Shenzhen nurtures numerous high-tech enterprises, which in turn empower the city with their cutting-edge technologies. 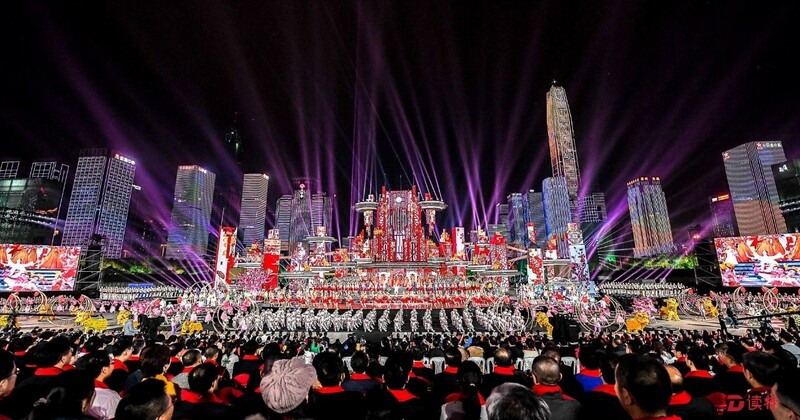 On the occasion of the fortieth anniversary of “Reform and Opening Up”, Shenzhen Spring Festival Gala showcased the technological powers and innovative dreams represented by this city. DOBOT robotic arms represent the innovation-driven Chinese private enterprise and promise a more advanced and bright future. At the beginning of the next 40 years, DOBOT will continue to help smart manufacturing to achieve high-quality development and show the world the strength of a great country.